Our books are written for enthusiasts and by an enthusiast. 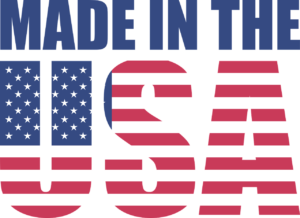 Mack Hils, the author, has owned dozens of antique Fords and has manufactured show winning reproduction pickup parts since 1972. He learned that large clear photographs are extremely valuable to restorers. However, they are seldom available, so he used them to make up the majority of these books. To these photos have been added expert captions, introductions and color plates. If you are interested in old Fords, you will find these books interesting. If you are restoring an old Ford covered by one of these books, you will find the information extremely valuable. Includes the four years of Model ‘A” 1928-31 with breakdown into 1928-29 closed cabs and open cabs, and 1930-31 closed cabs and open cabs. 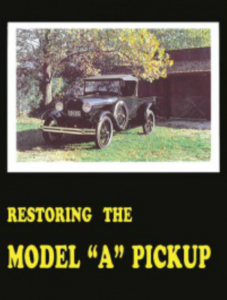 Describes factory colors, upholstery, body and bed details, supported by photos of original unrestored pickups, restored pickups, and factory photos of these pickups when they were new. Contains eight color photos and eighty-eight black & white photos with captions. 150 pages / 8.5 x 11″ / Color Cover. The Ford pickup went through many transformations in the years from 1932 to the 1952 model, including increased load capacity, increased physical size, and a shift to being more style conscious. All these changes and developments are followed step by step and many interchangeable body parts are listed. 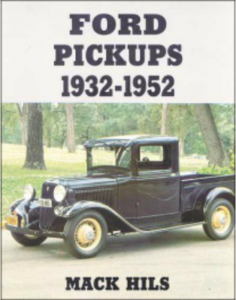 This book includes virtually every factory photo of 1/2 ton pickups of these years, spotters guide with dimension which allow the year of a pickup to be quickly determined, and over 100 8.5″ x 11″ original factory photos of these pickups when they were new. This book also contains seven color photos and 187 black and white photos with captions. 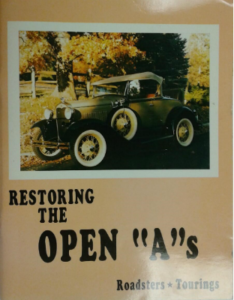 Includes the four years of Model ‘A’ open cars 1928-31, with a breakdown into 1928-29 Roadsters and Phaetons, and 1930-31 Roadsters and Phaetons. Describes factory colors, upholstery, body and top details supported by photos of original unrestored cars, restored cars, and factory photos of these cars when they were new. Contains nineteen color photos and 100 black & white photos with captions.